Stairways in room 22 and the western end of garden 10 indicate that these areas had upper-storey rooms. Bastet and Heres have recorded rooms above the front of the house. Mau recorded a large room above rooms 06 and 07 with remains of a pavement and simply decorated in the Third Style on a black ground. Mau also noted further rooms above the kitchen area. See Bastet, F.L., 1975. Forschungen im Haus des M. Lucretius Fronto. In Neue Forschungen in Pompeji, Recklinghausen: Aurel Bongers, p. 193-197. See Mau, A., 1901. Ausgrabungen vom Pompeji. 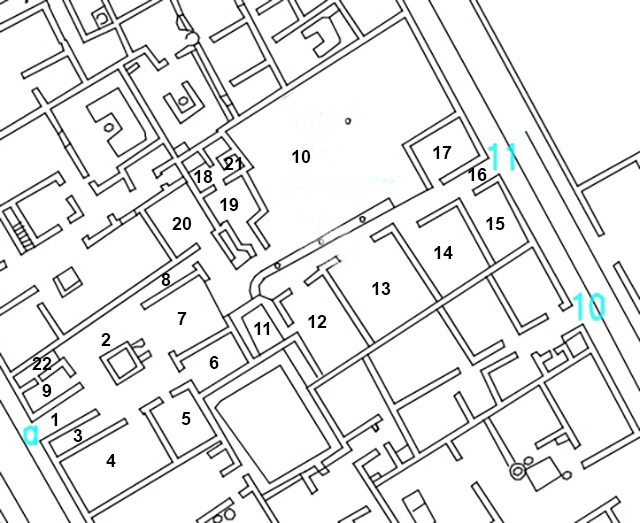 Mitteilungen des Deutschen Archäologischen Instituts, Römische Abteilung 16, p. 283-365. See Peters, W.J., Moormann E.M., Heres T.L. , 1993. La Casa di Marcus Lucretius Fronto a Pompei e le sue pitture. Amsterdam: Thesis Publishers, p. 83, Fig. 191. Dionysus with Silenus playing the lyre.